Belva Ann Bennett Lockwood, 1830–1917. American lawyer and political activist. 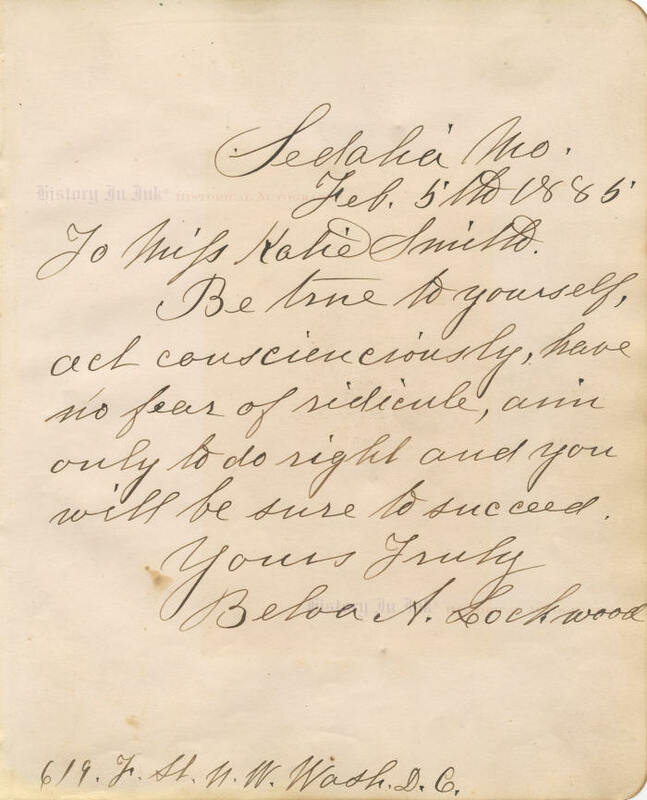 Autograph Note Signed, Belva A. Lockwood, one page, 6¾" x 8", Sedalia, Missouri, February 5, 1885. Lockwood—the first woman admitted to practice before the United States Supreme Court and the first to appear on official ballots as a candidate for President of the United States—inscribes an album page with her advice for success. She writes to “Miss Katie Smith,” in full: “Be true to yourself, act conscienciously [sic], have no fear of ridicule, aim only to do right and you will be sure to succeed. / Yours Truly . . . ." She adds her home address in Washington, D.C., at the bottom. Lockwood, a Washington, D.C., lawyer, wrote this note in an autograph album just three months after she ran as the Equal Rights Party candidate for President in 1884. The party was formed by a small group of women who were dissatisfied with the major partiesʼ resistance to granting women the right to vote. It bore the same name as a previous organization that had nominated womenʼs suffragist Victoria Woodhull for President in 1872, although Woodhull was too young to satisfy the constitutional age requirement for the office and conducted only a limited campaign. Lockwood conducted a full campaign for the presidency, the first woman to do so, insisting that although as a woman she could not vote, “I can be voted for." Her party had no campaign funds, so Lockwood paid for her campaign travel through lectures. In the end, she received only around 4,000 votes, given that women could not vote and the press largely opposed her—and indeed the Atlanta Constitution warned of “old lady Lockwood" and of “petticoat rule"—while Democrat Grover Cleveland won the presidency over his closest rival, Republican James G. Blaine of Maine. Lockwood petitioned Congress to have her votes counted in January 1885, shortly before she wrote this note, on the ground that she had evidence of voting fraud. Lockwood ran again as the partyʼs nominee in 1888, when Cleveland lost to Republican Benjamin Harrison. Although Lockwood was labeled a “suffragist,” her activism went far beyond voting rights. She worked for legal equality for women in general, including equal pay for women educators and federal government employees. She also worked for world peace. She fought a personal battle to attend law school and to practice law. After the Columbian Law School in the District of Columbia refused to admit her because the trustees thought that she would distract male students, she was admitted to and successfully completed her courses at the new National University Law School, but the school denied her a diploma in light of her male classmatesʼ objections that they would not graduate with a woman. She received the diploma in 1873 only after appealing to President Ulysses S. Grant, who was the ex officio president of the school. She was finally allowed to practice in federal court when Congress authorized qualified women lawyers to do so in 1879. She was sworn in as the first female member of the United States Supreme Court bar on March 3, 1879, and late the following year she became the first woman to argue a case before the Supreme Court. This is a beautiful item. Lockwood has penned and signed it boldly in brown ink. Her signature is a full 5" long. There are a couple of foxing spots, one of which is close to but does not affect the text. It is in fine condition. It is accompanied by an 1884 portrait of Lockwood, mounted to an album page, that bears Lockwoodʼs name in printed cursive type beneath the printed inscription “Yours, For Equal Civil and Political Rights."